YAAC keeps track of when all messages from all stations were heard. 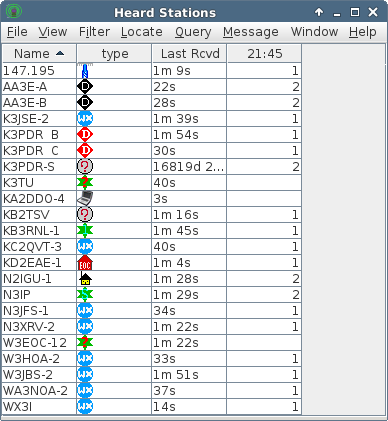 This timing information can be displayed as a statistical report table, showing the messages received for every 15-minute interval from each transmitting station. The times are automatically "binned" in counters lined up with the quarter hour boundaries in YAAC's current local time zone, and goes back as far in time as YAAC has kept messages for stations (configurable on the General tab of the expert-mode Configuration dialog).